The policies on this page apply to all health professions students undertaking placements in association with a Monash Rural Health site. The University's privacy guidelines explain why we collect and how we use student's personal information. The 2019 Monash Rural Health student accommodation policy and procedures ensure students have equitable and unbiased access to accommodation across our sites for short- and long-term clinical placements, where available. Some students will require leave from clinical placement from time to time due to religious holidays. The faculty follows the Monash Strict Religious Observances Guidelines. And a link to a multifaith calendar on the Diversity & Inclusion website can be used as a reference for staff and students. Where you do miss clinical placement days due to religious observance you will need to make up the time missed. The emergency response plans provide guidance on operations during emergencies on a usual business day. Emergencies such as Code Red and Pre-Declared Code Red (catastrophic) fire danger ratings and storm / flood / earthquakes and other emergencies. They apply to students on clinical placements and Monash Rural Health staff throughout regional Victoria. 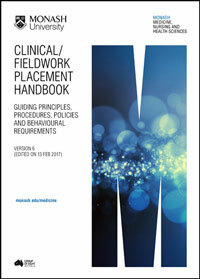 The student code of conduct outlines the professional behaviour expected of students on regional and rural placements.